Mumbai 18 July 2016 - Vegetable Peels, Don’t throw it away Make Your Own Facial At Home. Vegetable peel facial is one of the most popular facial procedures its is due to its chemical free properties. The bark or peel contains a huge amount of active nutrients and ingredients which help in rejuvenating facial tissues and keep the skin soft and supple. Vegetable peels will make your face look youthful and supple. If you are tired of using expensive chemical peels which give temporary results and damage to your skin in the long run, then vegetable peel facial should be the solution to all your problems. With the help of this powerful treatment you will improve your skin texture all you need to do is prepare the peel facial at home with a simple and natural ingredients available at home. Vegetables contain naturally existing AHAs which will help you in hydrating your skin, reducing wrinkles and fine lines. Peels will give you the best result for skin whitening, scrubbing and cleansing. You all know that we have different skin problems you need to choose the vegetable that will work best for your skin so you can choose the vegetable that will help you for getting the best result. You need to take half a cup of gelatin along with one cup of vegetable juice this will depends upon the type of skin you have. If you have dry skin, use cucumber. If oily skin then you can use tomatoes that should be a good option. Now combine the mixture together. You must Heat gelatin in a clean pan and let it stay for the next Twenty minutes. Wait till the gelatin has finally dissolved. Once you are done with these steps you need to pour the mixture in a bowl and keep the bowl in the fridge. Stir it quickly every 15 minutes. After 30 minutes, remove it from there. Your own vegetable peel facial pack is now ready! You need to take a towel and wet it with warm water. Remove the excess water and keep it on the face. You should be able to tolerate the temperature that will help you in opening up the pores of your skin. You can also use rose water with cotton to wipe your face. After doing that you take some gelatin and apply it all over your face. Apply the vegetable peel pack. It is advised to use eggs along with that. This will brightens your skin tone and gives you a cleaner look. Keep it for 20 to 30 minutes or until it is completely dried. Once it is dry, gently peel the mask off your skin. Now this might take a little time by doing all this step you must be patient throughout the procedure. After doing this you can go ahead and wash your face with cold water. If you would like to use a nice massage gel for the face, you could do that too for the next 10 to 15 minutes. You could wash your face off with milk too. Now that you are done with the vegetable peel, take any face pack that goes well with your skin and apply all over the face. Wash it off after 15 minutes. Use cucumber slices for the eyes. 2 - It improves the texture of your skin and makes it soft. 3 - It help Your skin to glow. 4 - You will be able to keep your skin clean at all times. 6 - If you have dull skin, this one shall give you all the shine you want. Cucumber Peels is the Best homemade peels for the skin care. It is one of the popular vegetable to beat the body heat and cucumber is also famous for the skin care it help you to reduce dark circles,tighten your skin, close pores and even kill bacteria around the eyes cucumber pieces works great, its peel is also helpful to treat the spot on the face. This vegetable best suits normal to oily skin. Reduce puffy Eyes - Cucumbers have been used as a remedy for puffy eyes since cucumber contain antioxidants that help to reduce irritation and the cold reduces puffiness. Getting rid of Freckles - A freckle is a small spot on your skin. Most of us have freckles but for those of you who don’t want freckles, there are many natural remedies for getting rid of them. Using cucumber juice is one of the most popular methods to get rid of Freckles Grated cucumber is used as a tonic you need to spread the grated cucumber all over the face and neck to get rid of freckles. Cucumber Improves complexion - The most common use of cucumber is that it improve complexion and rejuvenate your skin. When cucumber juice is mixed with few drops of lemon juice and applied as facial mask it makes your skin glow by removing scars and pigmentation. Treat a Sunburn - if you are dealing with sunburn problems than cucumber can also help you in this. The cooling effect of cucumber is a natural and simple way to soothe your skin and speed up the healing process. Apply the cucumber slices to your skin since Research shows that cucumber can effectively block the sun when needed. Tighten open Pores - Blend a few cucumber slices and 2 tablespoon of lemon juice into a smooth paste. Apply the pack on your face and leave for about 15 minutes. Rinse your face with cool water. It is an excellent face pack to reduce the appearance of large pores,reduce pigmentation, improve complexion and lighten acne scars. Banish cellulite - Watery, hydrating, vitamin rich composition you must rub cucumber slices all over our bodies on the regular. External application of the phytochemicals in cucumber tighten collagen to firm the skin’s outer layer which will result in an instant reduction of the appearance of cellulite. starchy vegetable work best for your skin. Peel out the skin of bottle gourd and rub it on your face to get instant glowing skin. By doing this remedy for once in a week that will keep your skin beautiful and fresh. Bottle gourd is a useful vegetable that can help your skin to get its glow back. 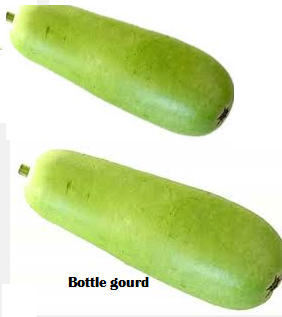 By Drinking bottle gourd juice gives you a healthy glow to your skin, prevent pimples, acnes by promoting inner health. Lauki juice is good for your skin and your hair. Regularly drinking lauki juice early in the morning there are chances that you would not get premature grey hair. Bitter gourd is a super vegetable which has many such properties, which will not only give you a glowing skin, but will also cut down your cellulite before your D-day arrives. Apply the Bitter gourd juice to reduce dark spots and scars of your skin. You can prepare it by squeezing the smashed peel. Regular use of bitter gourd peels 2 or 3 times a week will help in treating scars. Apply Lemon peel it is a natural works wonders for any skin type in treating facial hair which is very easy. It works like a bleaching agent, bleaches your skin, also help you to remove tan from face, reduces acne, pimples, and helps to treat various skin problems. fine lines and keep your skin look younger. Sweet Potato is one the most nutritious foods when it comes to health and beauty benefits. 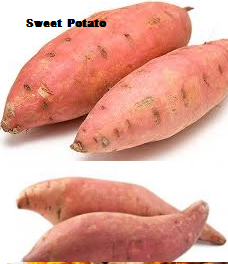 Sweet potato helps cure tan caused due to sun rays. Sweet Potato treat Oily Skin, Improves Skin Texture, Cures Dry & Cracked Heels,Heals Dark Eye Circles & Eye Puffiness,Prevents Premature Aging,Moisturizes your Skin, Maintains Elasticity of Skin and lots more. Green Banana is used as a skin whitener and helps to lighten your skin tone. The peel of banana improves your skin tone, improves the skin complexion. For best results use the peel of green banana. Take it out and rub it on your face and neck line regularly to get the difference. Radish has a high amount of Vitamin B6 and helps to clean out blackheads. You should rub a radish peel on the blackheads area which will softens blackheads and helps to fall off. The vitamins present in radishes can treat skin disorders. Radishes have a good water content that helps in keeping your body well hydrated all the time which results in a healthy and well hydrated skin. It fights dry and flaky skin too. Beetroot juice contains a significant amount of vitamin C that helps with skin discoloration and pigmentation. Beetroot can make your skin smooth and supple because it removes the top layer of dead cells and Drinking beetroot juice can also help keep your skin hydrated. Tomatoes are a staple in every kitchen not only tomatoes taste great but they also keep the health of your skin healthy. Tomato is rich in antioxidant that helps in removing blemishes and spots from your skin. Mix honey with tomato juice unless you get a thick paste. You Must Apply this mixture and wash off after 15 minutes to have smooth and glowing skin. Leafy greens are considered great for skin. Cabbage is rich in vitamin A, B, C, K and P which keep your skin well nourished. Cabbage helps in skin tightening, reduces lines and wrinkles. Cabbage the rich amount of Vitamin C in this vegetable keeps your skin youthful and delays the aging process. as well as Vitamin A present in cabbage juice works together with Vitamin D to make your skin clear and healthy. It also avoids the destruction of skin cells due to ultraviolet rays.